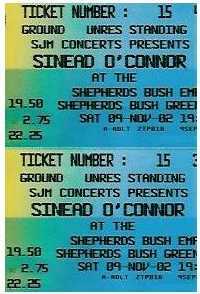 Tours | Welcome to the Tours area of Sinéad O'Connor. From here, you will find confirmed and non-confirmed news from various sources by Sinéad's admirers, internet, newspaper, press, and other sources. Openair Am Greifensee Greifensee, Switzerland 4/september/2009 ?, ?
? Paradiso, Amsterdam, Holland 16/August/2009 ? Quimper Festival Quimper Festival, France 23/July/2009 ? Positivus Festival Positivus Festival, Latvia 18/July/2009 ? Vienne Festival Vienne Festival, France 15/July/2009 ?
? Athens, Greece 12/June/2009 ?
? Bucharest, Romania 11/June/2009 ?
? B1 Max, Moscow, Russia 23/April/2009 ? Beatlefest Sorrento, Italy 20/July/2008 ? Solistes Au Domaine Bruxelles, Belgium 13/September/2008 ? Olympia Paris France 12-nov-2005 ? ? First Avenue Mineapolis Mineapolis 28-nov-2005 ? ? House of Blues Cleveland Ohio 2-dec-2005 ? ? Avalon Boston MA 5-dec-2005 ? ? Webster Hall New York New York 8-dec-2005 thu ? Webster Hall New York New York 9-dec-2005 fri ? Tivoli Theatre Dublin IRE 9-MAR-2003 ? ? Steve Wickham Guest Dates With Sinéad O'Connor Confirmed. Steve Wickham will be performing with Sinéad O'Connor on her upcoming Irish and British tour promoting her new album "Sean-Nós Nua". Steve Wickham potvrdil hosťovanie so Sinéad O'Connor. Steve Wickham bude vystupovať so Sinéad O'Connor na jej pripravovanom írskom a britskom turné podporujúcom predaj jej nového albumu "Sean-Nós Nua". Nerve Centre Derry UK Wed 9/10/2002 wed ?